My live demonstration Success Summit approach to marketing, sales and management will guide you in a way that is like an on-site, "look over my shoulder" two-day private coaching session from me. Get the course DVDs where I go "deep" into my step-by-step process as you create your own customized marketing plan using the fill-in-the-blanks, follow along Playbook. This is specifically for CPAs, Attorneys and EAs who want to jump start their marketing, hit the ground running on setting up all their front office systems and get their sales process perfected to get retained by more clients using my One Call Close process and other sales strategies, including overcoming objections! Because let's face it, it doesn't matter how much money you spend on marketing, if you don't have a system for qualifying prospects, answering the phones, or better yet, knowing how to get retained and having the client pay your fees up front, you've just wasted a lot of money on marketing. Over 14 hours of in-depth, very specific training on 11 professionally edited DVDs PLUS the 220 page Fill-In-Template Playbook! 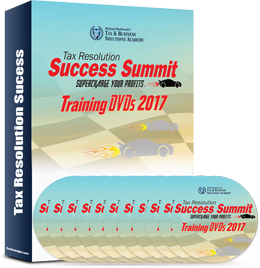 Yes, these are some of the most important strategies I teach in my Tax Resolution System BUT watching these DVD’s and following along in the Playbook is like I’m teaching you "live" in your office. You can focus on the best strategies and Systems for your individual practice. Fill out your Playbook and complete your individualized written marketing plan. I'll show you how to figure out what you need to spend on marketing each month to achieve your individual income projections. My Success Summit approach can guide you in a way that is like an on-site, "look over my shoulder" two-day private coaching session from me. How to Conduct The "One Call/Meeting Close"
Your investment is just $397! "These systems and processes work. The Roz team has an incredible program. The direct mail campaign, newsletter marketing and responses I’ve gotten from people, the clients and referrals have been absolutely phenomenal. I would have never come up with these ideas on my own. It’s changed my business and professional life." "Mike cuts to the chase; he gets to the bottom line very quickly. You don’t waste any time or any money; he specifically says what you need to do for marketing in order to generate the revenue you want to generate."